First off, I wanted to thank you all for your tremendous support! I just recently reached over 100 GVests from all the voters influence. I wanted to do a quick update and then include most of the projects and future ideas I want to work on. Below you can see my current witness position and my received vests etc. 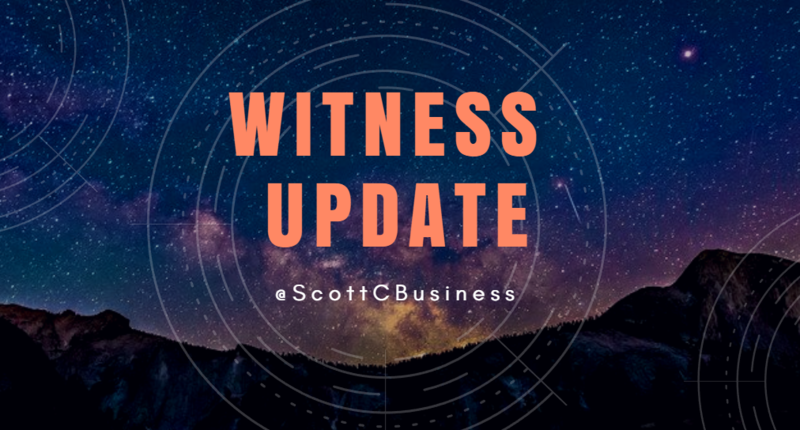 Witness Interviews - I'd love to work with some other people to get a consistent interview schedule going with witnesses on a weekly basis. Correcting Steemit tag use - Tags should be used to inform, not for upvotes. So, I believe that we should follow suit with blogger, wordpress and medium and allow more tags used to allow for branded hashtags as well as informational, niche, and categorical tags for indexing. Originally I shared "The Downvote Proposal" as a point of my political views and personal values, but with enough support we could turn this into a full on movement. I think we need a downvote that doesn't affect reputation and or a way to fix flag abuse. Bot Limits - we need bot limits on how much you can upvote per bot. It makes sense to have like a 5 SBD limit to at least deter people from massive self promotional bids and make it more of a nuisance to do so. Minnow Representation - not sure what I will do here, but I plan to help more minnows find ways to get noticed and break the minnow ceiling earlier if their content is quality. Our pinned post has a bunch of resource for you to use and contribute to! We have lists of other servers, upvote bots, promo, discussion, contests, faucets, and everything you can think of! Hey man, finally caught up with you. Thanks for showing me some love during the holidays. I went thru many of your post and returned the favor with upvotes. Thanks again, take it easy man. Hi, Scott. Just passed to read what your proposals as a witness are. Glad I did it. I definitely like what I found and voted you as a witness. Cheers. Hi Scott. I’m just 71 days old here at Steemit and I’m not sure if this is an appropriate way to ask a question, but I think the topic might just help someone else. 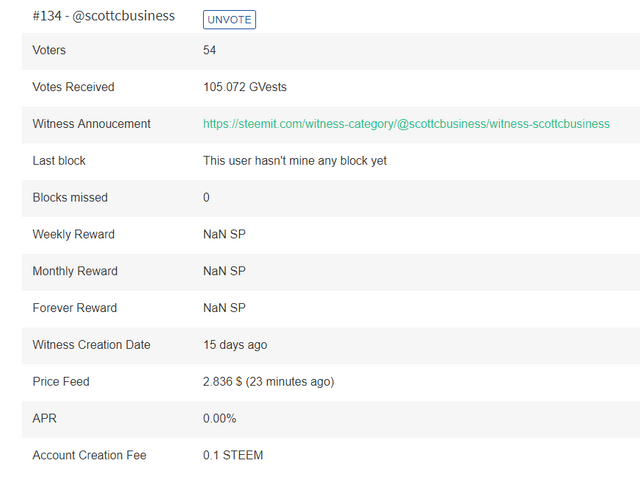 I’m trying to learn this Steemit thing, so while clicking around I found the part about what witnesses I voted for. Now I know I voted for you, but you’re not listed. So I went to Steemd, your still not listed. Then I went to the list of supporters you have provided, and there I am. I voted a while back, so I don’t think it’s a lag issue. So to get to the question, actually two, can you confirm that I indeed cast a vote for you? (as a rookie, nothing is more frustrating than not counting) And is there a bug that will allow me to vote for 31 witnesses? BTW thanks for all you do. Thought I was busy. If you use SteemPlus it shows who you have voted for. I don't think there is a bug that lets you vote for more, you are only voting for 3 at the moment though. Done. And you are now my 4th witness. Not sure what happened. Thanks for clearing that up for me. How do you find time for anything else my dear friend? That's a lot of projects. And I'm glad that you at least put out something saying what you're doing. A lot of witnesses don't do that. Never give Give up all of your hard work and remember any one man can change the world. Продолжаю следить за вашими нововведениями. Спасибо, ваша поддержка всегда ценится! https://www.mannabase.com/?ref=9d27bc9475 I used your referral and registered for that but for the last step verified my phone number. Please provide a valid mobile number. I tried a couple my phone numbers none of them are working. do you have this experience? Thanks for the SBD, please update us regularly on the progress and we will be happy to participate or help up... keep up with the good work~! good job, @scottcbusiness! keep going, I'm happy to support you. I think you should consider @youarehope as a charitable candidate. Its run by @sircork who's also a witness. I agree about a downvote system that doesn't harm reputation.